This is a women's group. CLASS IS RUNNING THIS TODAY! Belly dance arts is all about learning how to belly dance. Such as technique, Improvisation, Dance choreography and other great stuff. It includes learning how to dance with props like silk as well as incorporating different belly dance style of Egyptian Turkish American North African Folkloric and theatrical fusion belly dance. 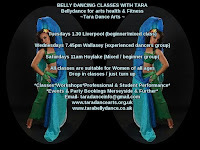 Bellydance fitness is about how the way the class is creativity put together so participants can get the most out of attending for fitness health and wellbeing. From the moment the class starts we are up and moving around actually dancing throughout. Keeping the heart rate up adding in resistance exersise so we can strengthen weak mucsles and applying safe and simple flexibility exersise. All this is done without having to get down on the floor. The only time we may go down to the floor is if we practice Turkish floor dance which is not much and if it is done I bring yoga mats & knee pads for safety, plus there is always the option to stay standing because most of the moves can be done on the floor or standing. So is it bellydance arts or bellydance fitness I'll be learning? Both. You will be learning how to belly dance firstly. How the class is put together is how you benefit from the fitness part. How is this class different to others? I am a facilitator of belly dance which means I am a skilled leaders of the group I host and am part of it rather than be dictater or putting myself above everyone. I am a community dance leader meaning I believe everyone has the ability to learn how to dance and how to express themselves through dance. I create a positive dance environment and performance platform where people are valued and feel safe to dance and be part of a community or group. Community dance has been studied academically through sociology and is evidence based. We have class outings to eat and watch live performances at other dancers and teachers parties and events privately in the belly dance community (by invite only - not open to the public) We also have our own night / day outs and small class Hafla show parties. Everyone who comes to class is welcome to come along. Only for those who want to nobody is ever forced. Tara and her group often accept repeat invitations to perform at lots of events in Merseyside. Opportunities exclusive to those who turn up regularly to class, put effort in and are reliable.